Going into the studio space at the St James Theatre last night I was completely unprepared for what awaited me. 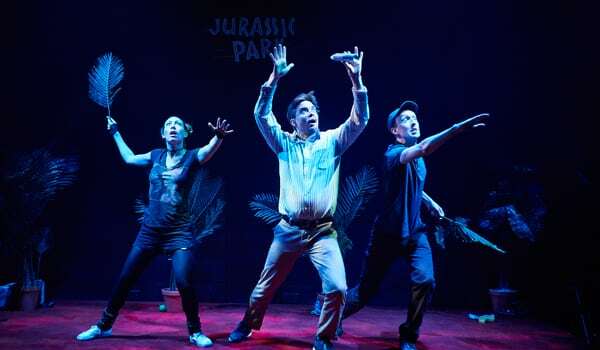 I’d not heard any of the hype that surrounded Dinosaur Park during the last Edinburgh Festival, and not seen any of the press material for the show prior to seeing the show itself. When the Park family and friends gather to hold a memorial for their mother Madeleine, this most dysfunctional of families chooses to come together by screening their favourite film Jurassic Park. One small problem, the video tape, lovingly recorded from the TV is missing. Superbolt Theatre’s production takes iconic moments from the well known film, intertwining it with moments from the family’s past, sometimes to a point where film and life are indistinguishable. The performance is spearheaded by three of the most dynamic performances you are likely to see on stage. Maria Askew, Frode Gjerløw and Simon Meader not only take on the roles of the Park family but also inhabit the characters and many of the dinosaurs from the film. This trio are perfectly in sync, characters and movement is nuanced and is quick to ensnare its audience as you are drawn into the Park family’s emotional spiderweb, laughing one moment before receiving the emotional punch as a family disintegrates over parental separation. There were several stand out moments for me, Askew’s hilarious take on Jeff Goldblum was a treat, the incredible physicality of the T-Rex, Dennis Nedry’s theft of the dino dna, and the vibrating glass of water that signified the arrival of the t-rex had me laughing out loud. It’s been many years since I saw Jurassic Park, so I can attest to the fact that you don’t need to be a super-fan of the film to understand the show. There is no doubt though that the better you know the film the more you will get out of this stunning piece of theatre. 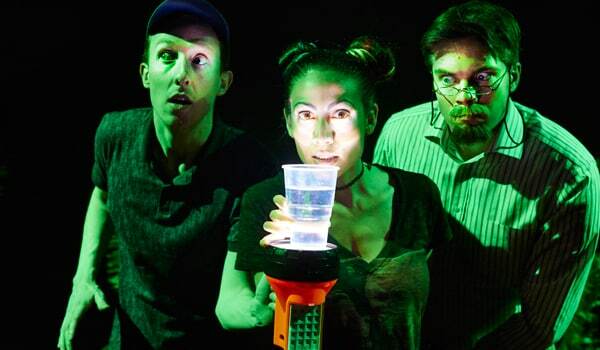 Superbolt Theatre’s production is fast paced and pure theatrical magic. Imagination is everything in this production driven by a trio of incredible actors.